Monanthes muralis (Webb ex Bolle) Hook.f. Bot. Mag. 98: t. 5988 1872. Origin and Habitat: Monanthes muralis is endemic to the islands of El Hierro and La Palma (and perhaps Gomera), in the Canary archipelago, Spain. Habitat and ecology: This species is fairly common on cliffs and walls. Petrophyes muralis subs. subcrassicaulis (Kuntze) Bornm. Description: Monanthes muralis is a densely branched dwarf perennial succulent shrub 5-10 cm high with tiny dull green, slightly furrowed, oval leaves spotted with red. The flower is whitish-pink circular with a raised centre and surrounded by a number of short points giving the effect of a many- pointed star, the whole carried on a thin pedicel. Stems, leaves, and sepals papillose. In growth form this species is intermediate between the shrubby Monanthes laxiflora, and Monanthes polyphylla. Derivation of specific name: The specific epithet comes from the Latin 'muralis', 'pertaining or belonging to walls' and refers to the fact that this plant usually grows on walls or on vertical stone cliffs. Stems: Ascending or decumbent, later often pendulous, tortuous, slender, 2-5 mm in diameter, branched, basally slightly woody, papillose, glandular-hairy. Leaves: Rosulate, densely crowded, obovate, rounded or somewhat acute, 6–10 mm long, 3–4 mm wide, 2 mm thick, slightly furrowed, dull green, spotted with purple, not furrowed, with some glandular hairs in the lower part, apically conspicuously papillose, especially along the margins, without platelets. Rosetes: Compact with about 6 -10 leaves in the extremity of the stems, the innermost leaves soon diverging from the axis almost at right angles. Parastichy number 2:3. Inflorescence: Terminal from the centres of the rosettes, 1-7 flowered, basally branched, the flowers on filiform pedicels. Pedicels 5-15 mm long, glandular-hairy, hairs to 0.7 mm long. Flowers: Whitish-pink 6- to 7-merous, small and inconspicuous, 3 - 5 mm in diameter. Sepals papillose dorsally, glandular-hairy. Petals narrowly oblong, acuminate, 2.9–4.1 mm long, 0.5–0.7 mm wide, glandular-hairy; hairs to 0.3 mm long along the margins, lamina somewhat fan-shaped, retuse, finely toothed, clawed or basally attenuate. Nectaries distinctly clawed 1.2-1.7 mm long, 1.4-2.1 mm wide. 1) T. H. M. Mes, G.-J. 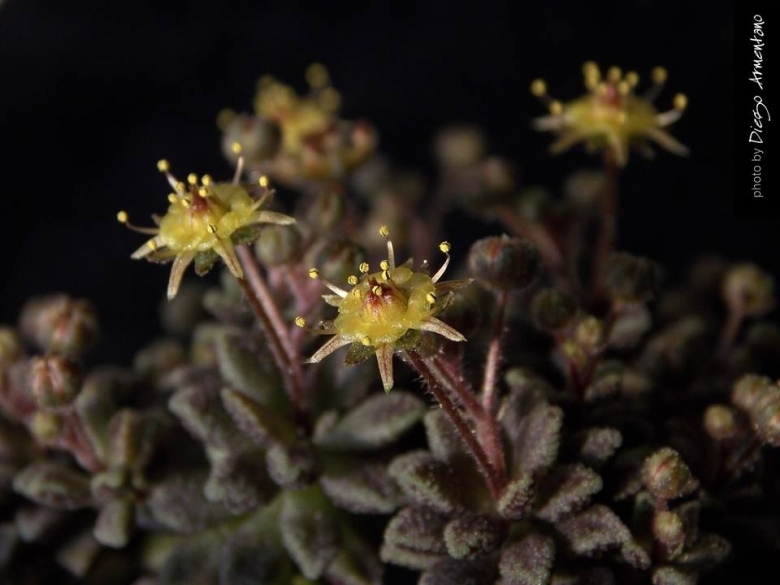 Wijer, and H. ‘t Hart, "Phylogenetic relationships in Monanthes (Crassulaceae) based on morphological, chloroplast and nuclear DNA variation", J. evol. biol. IO (1997) 193-216. Cultivation and Propagation: Monanthes muralis is one of the more common species in cultivation, that takes very little place in the collection and is asking very little attention. The only demand is a very poor substrate, little water and a mid-shade place. The only things that can kill this plant are cold, hot blasting sun and overwatering. The flowers are jewel-like but not often seen, especially when the plant is grown in shade where it seems to do best. Nevertheless, it is appropriate to provide adequate growing conditions in order to obtain compact plant with many flowers. Watering: It likes a winter's rest and should be kept dry during the winter months. From early spring onwards the plant will begin to grow and watering should be increased gradually until late spring when the plant should be in full growth. Water regularly during the aestival growth cycle so long as the plant pot is allowed to drain and not sit in a tray of water (this plant need plenty of water) But needs to be avoided wetting the bodies of these plants while they are in sunlight. A wet plant in the sun light can cause sun burning which can lead to scares or even fungal infections and death. From late summer watering should be reduced to force the plant to go in to a state of semi dormancy, by autumn you should be back in to the winter watering regime. Keep dry with ample airflow in winter (but for outdoors cultivation it is somewhat resistant to wet conditions, too if grown in very draining substrata). In the rest period no high atmospheric humidity!! Care must be taken with watering as they tends to become swollen and untidy in growth habit if given too much water and shade. Propagation: The branching nature of this plant makes it easy to take an abundance of cuttings which root readily. It is also easy to propagate through seed. Seed germinate in 14-21 days at 21°C. Sow in a well drained medium.